Summer is here and it is time to serve your guests the tastes of the season. Celebrate the longest day of the year with fresh fruit from the local farmer’s market and herbs picked right from the backyard garden. This featured appetizer and sparkling drink will make guests remember this social as the party that made the sun stand still. Cook polenta over medium-high heat in medium-sized pan with 2 Tbsp. extra virgin olive oil until golden. Sprinkle with salt and pepper. Place polenta on paper towel to removed excess grease. Place all desired vegetables, onion and garlic on foil-covered baking sheet. Drizzle extra virgin olive oil, salt and pepper over mixture. Bake for 15 minutes. In separate bowl, combine mustard, 2 Tbsp of extra virgin olive oil, salt and pepper. Coat cooked veggies in mixture. 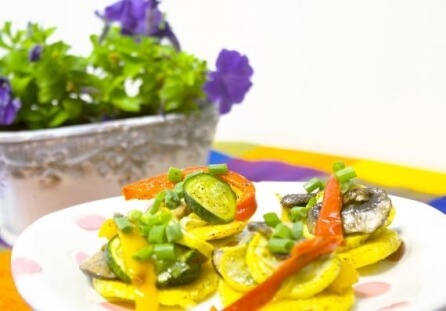 Place vegetables on top of polenta and serve as appetizer. In a large pitcher, mix sparkling water, orange juice and undrained can of peaches. Place sliced mangoes and blackberries in individual drinkware. Pour sparkling mix over fruit and serve chilled. Serve with Name Skewers and enjoy! Cut tape in 2-inch pieces. Place top of skewer in the middle of the tape and fold the outer sides of tape together. 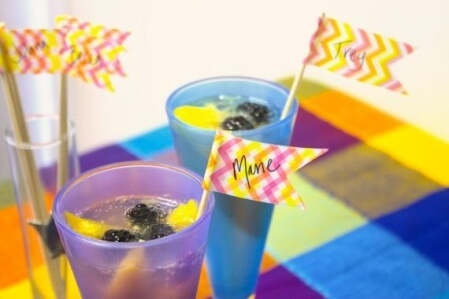 For Name Skewers: Have guests write their names on tape and place in drinking glass to avoid drink mix-ups. 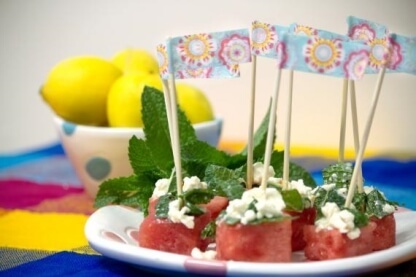 For Party Skewers: Write appetizer name on tape or leave blank and use different prints for different appetizers.